Heat honey, milk and sugar in a pan while stirring until the sugar has dissolved, cool. Stir in the egg. Mix the flour and all ingredients up to and including the gingerbread spice, add to the honey mixture, knead to form a smooth dough and leave to rest for approx. 30 mins. Halve the dough, roll out to approx. 1 cm thick between two sheets of baking paper, cut into strips measuring approx. 7 cm. With wet hands, shape the almond mixture into rolls (approx. 1.5 cm in diameter. 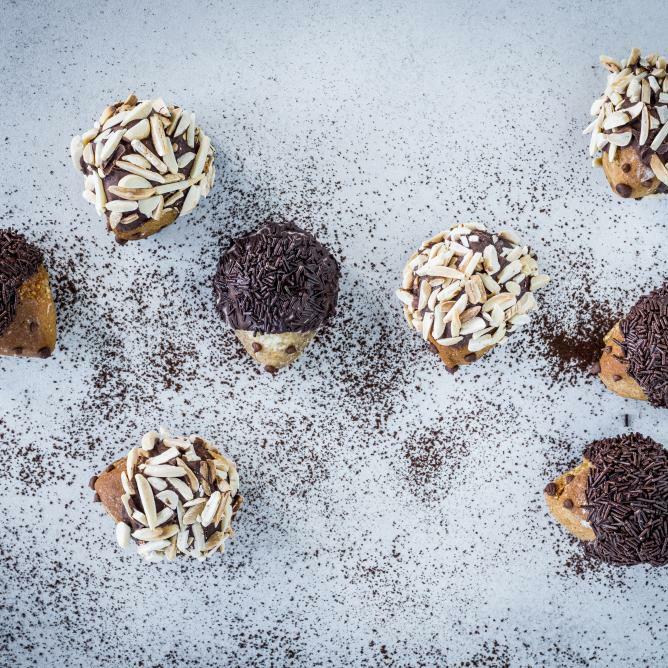 Place the almond rolls in the middle of the dough strips, roll lengthwise, cut into pieces approx.. 2 cm wide, shape into balls with your hands and use two fingers to press them into a drop shape, then place on a baking tray lined with baking paper. Approx. 25 mins. in the centre of an oven preheated to 180°C. Remove from the oven, coat with cream immediately, leave to cool in a well-sealed biscuit tin. Place the chocolate in a thin-sided bowl and suspend over a gently simmering bain-marie, ensuring that the bowl does not touch the water. Melt the chocolate. Dip the hedgehog bodies into the chocolate, sprinkle with almond slivers or chocolate shavings, draw eyes and a nose with chocolate.